Commentary on the designs is my own except as noted. 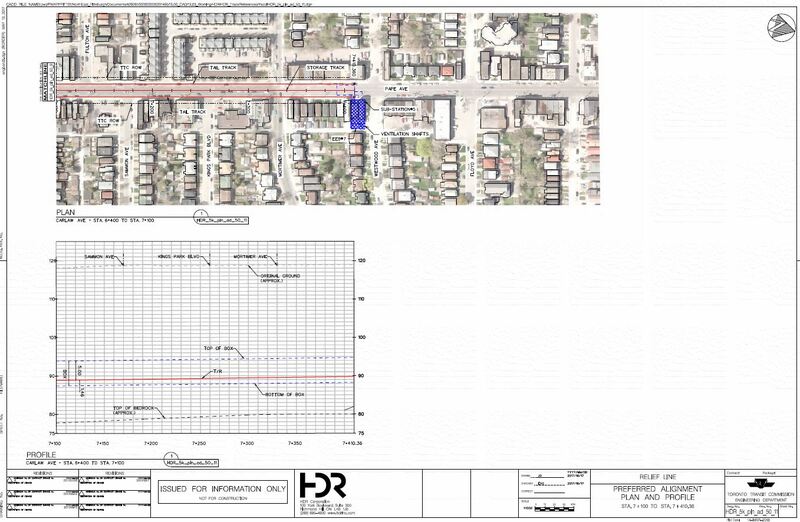 Thanks to the City of Toronto Planning Department for provision of the electronic versions of the plans from which the illustrations here are taken. For further information, please see the Relief Line South website. A few questions about the new line are separate from the actual design. The answers below are taken from an email response from City Planning. 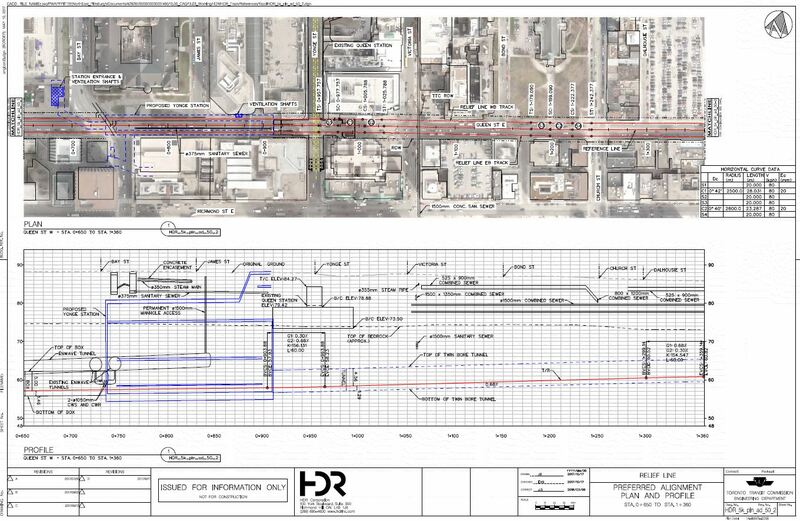 Q: At one point there was talk of a connection track under the GO corridor branching off near Gerrard Station. 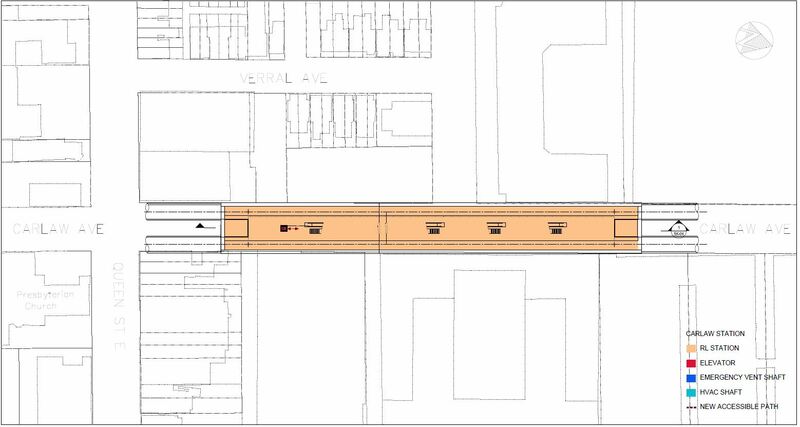 I don’t remember seeing any report where this was explicitly discarded, although the location of Gerrard station now that there is a dogleg from Pape to Carlaw could affect the design of any connecting track. 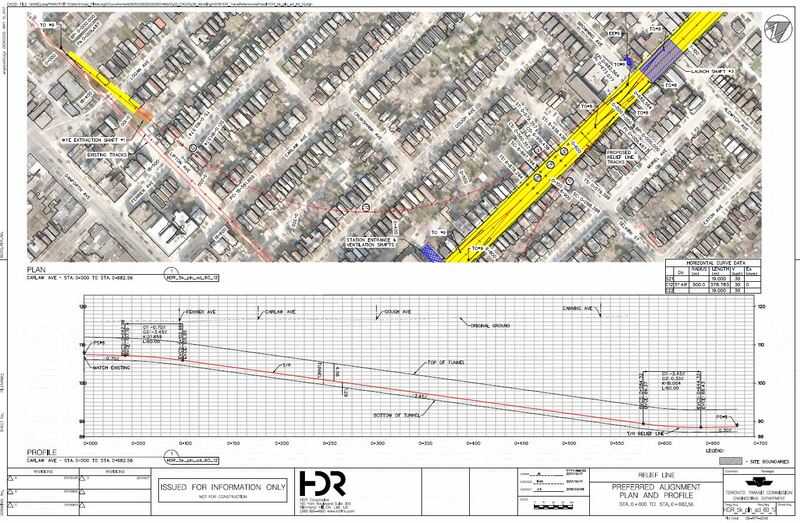 This is directly related to the effects of the wye design at Danforth, and whether there has been any analysis of the comparative impacts and costs of the two schemes. 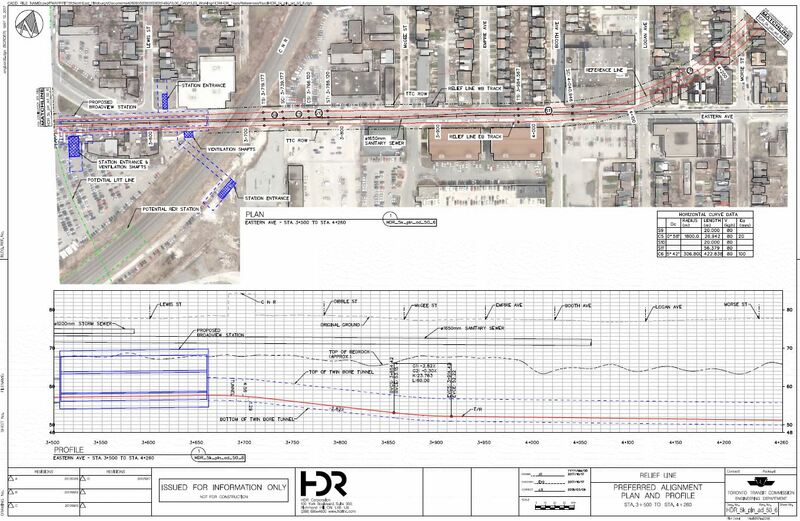 A: In discussion with TTC operations, particularly with respect to yard capacity, it was determined that Greenwood Yard would not be able to accommodate the additional fleet requirements of the RLS and therefore storage would have to be provided on the line. 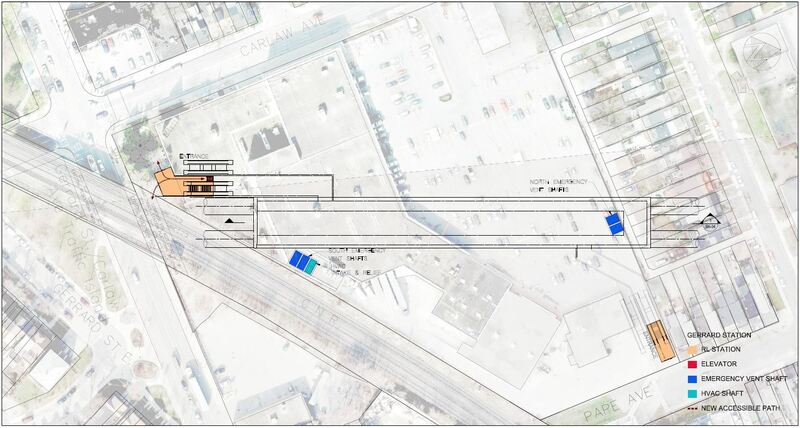 The potential connection between Gerrard and Pape running under the GO Corridor would require a portal in Greenwood Yard that would significantly impact the current yard design and capacity as it requires a substantial footprint. 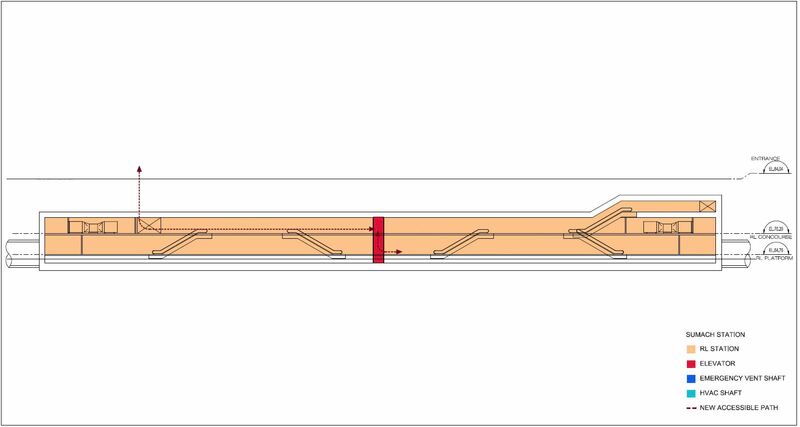 To be cost effective it would have to be a single track connection which would offer no redundancy. In addition there were substantial risks involved from a structural and approval perspective to go forward with this option based on conceptual design. Q: Will the streetcar services, after having been shut down, ever reappear? For Queen this doesn’t make sense because access to the east end carhouses requires this. For Gerrard, an assumption that somehow the rest of the Carlton line is expendable because the RLS manages to intercept some riders at Carlaw is rather short-sighted. A: There are no plans to eliminate any streetcar service as part of this project. 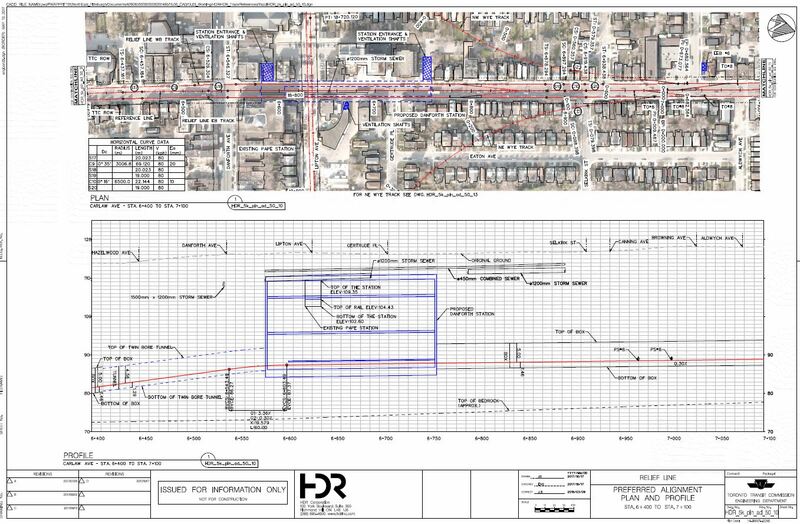 While streetcar ridership between Carlaw and downtown may be reduced, it may increase east of Carlaw as more people connect to the new subway. 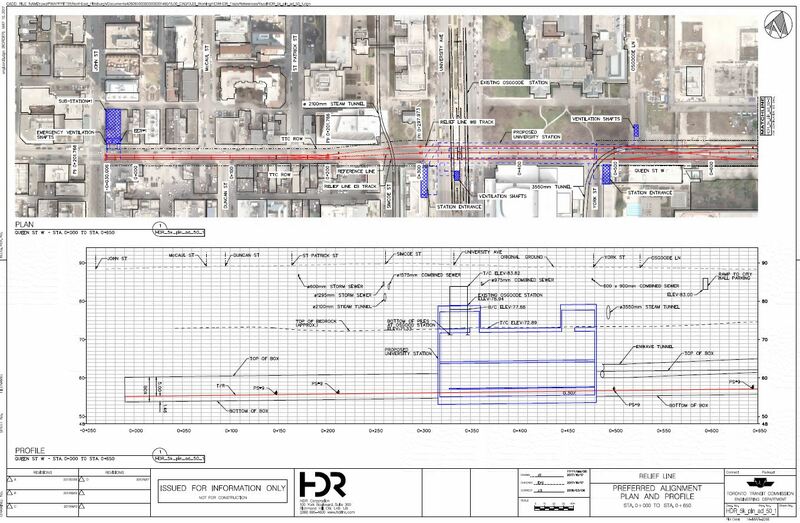 This phase of the Relief Line will have no effect on the very busy demand on the same streetcar routes west of downtown. Q: This begs the need for something more definitive from the TTC including plans for maintaining service to the degree possible during construction. 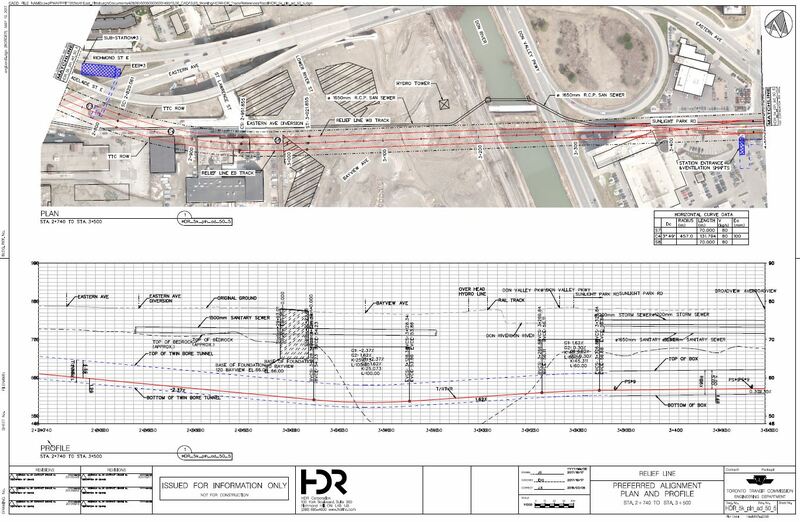 There is also the question of the relative timing of construction of lines in the waterfront including the Broadview connection and the Cherry extension linking up to Queens Quay. 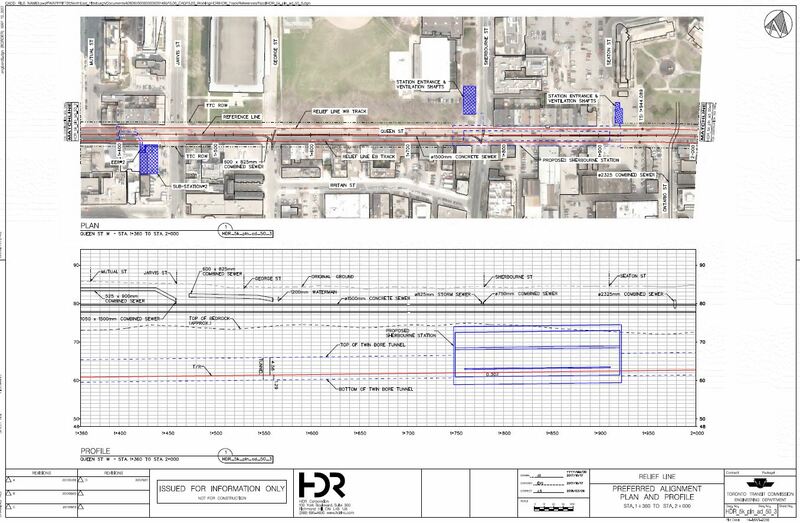 There really is the sense that a goodly chunk of the streetcar system can simply be shut down to accommodate the DRL construction. Comments please. A: As design progresses, the construction methods, impact and schedules will be further developed and will inform temporary service changes during construction. Service is expected to be maintained during construction, either by using replacement buses or by diverting streetcars. 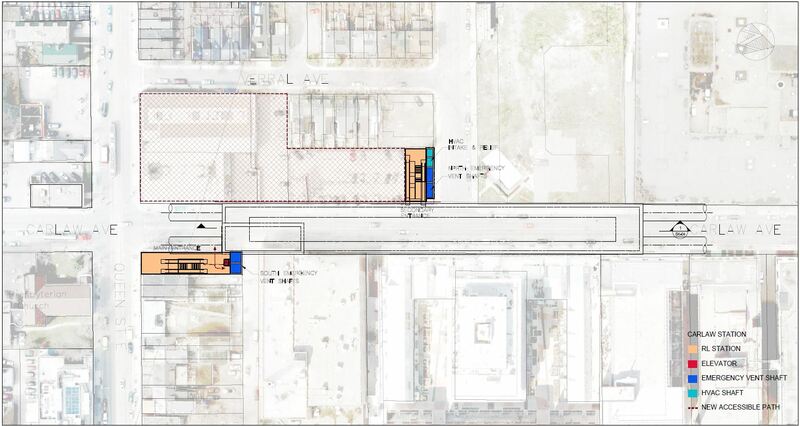 It will be a priority to maintain access to the two east end carhouses and provide necessary alternative streetcar routings. There will also be efforts to coordinate construction of multiple projects, if possible. 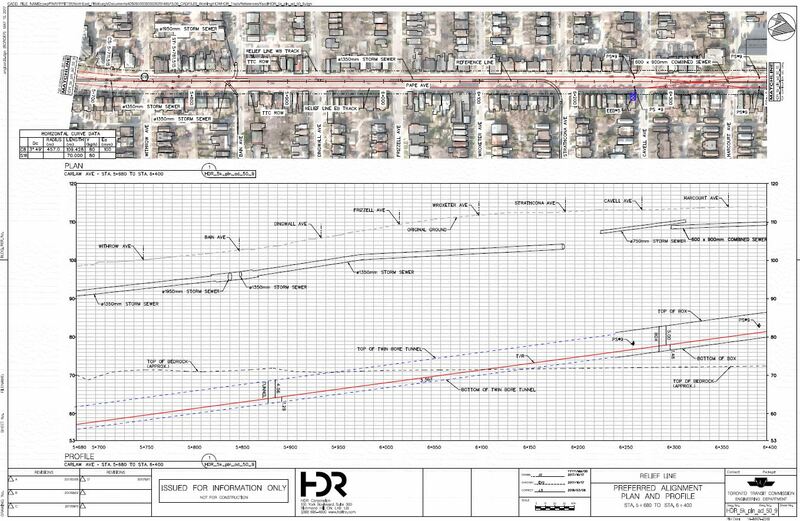 Through much of the alignment of the Relief Line South (RLS), the line will be tunnelled through bedrock, unlike all previous lines in Toronto which have avoided going that deep. 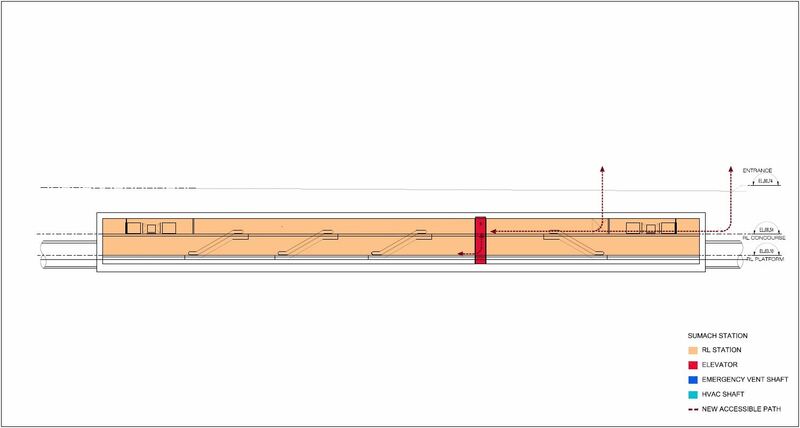 The level of bedrock is shown on the alignment drawings. This has advantages including the avoidance of existing utilities, better stability for construction near existing buildings, and better noise isolation. 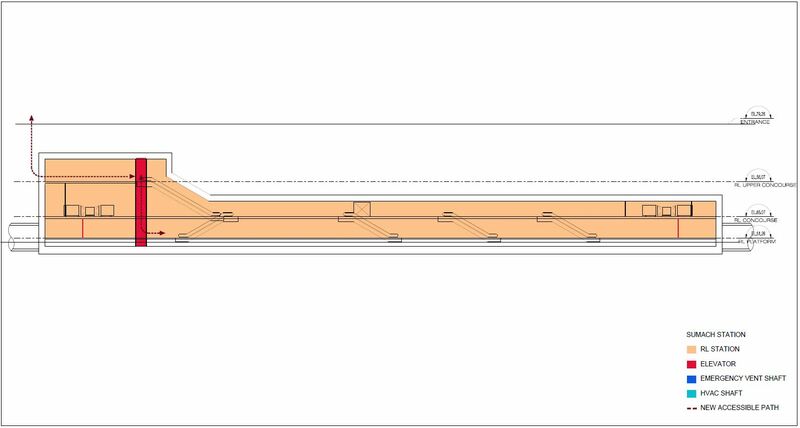 The tradeoff is that some of the stations are quite deep, and this will add to access time between the surface and platform level, and even between platform levels at interchanges. The short vertical links well known at Bloor-Yonge and St. George are not the kind of connection one will find for the RLS. 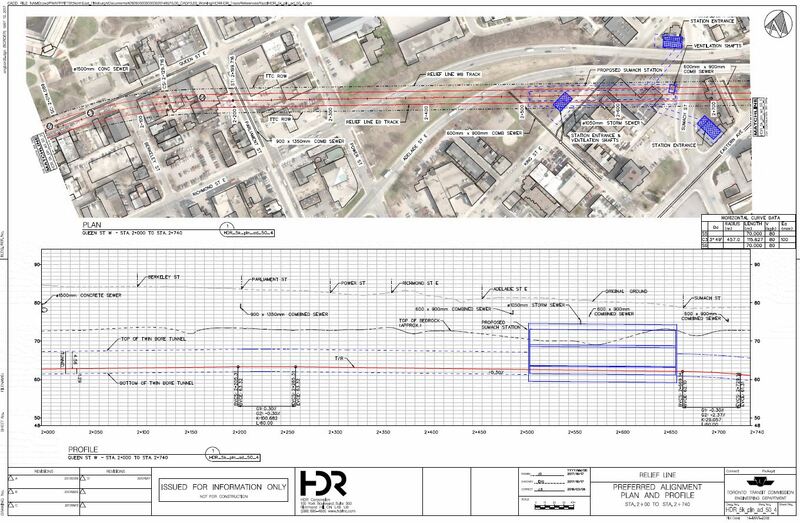 The tunnels would be built in two drives from a common launch site at the future Broadview-Eastern station location. 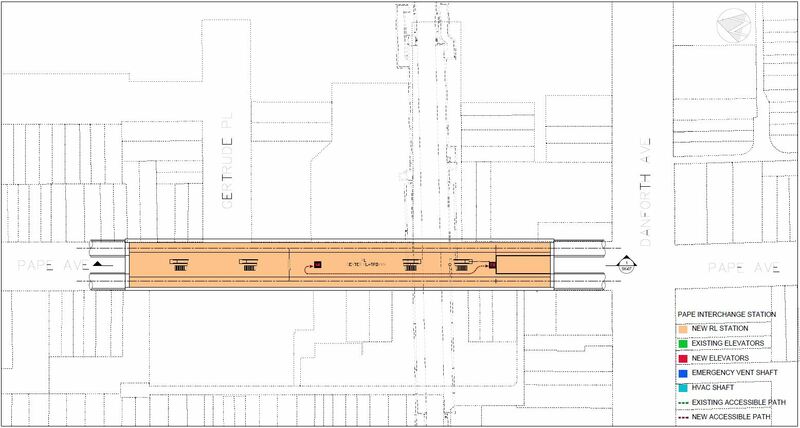 One pair of TBMs will drive west toward Osgoode Station while the other pair drives east and north to Pape Station. 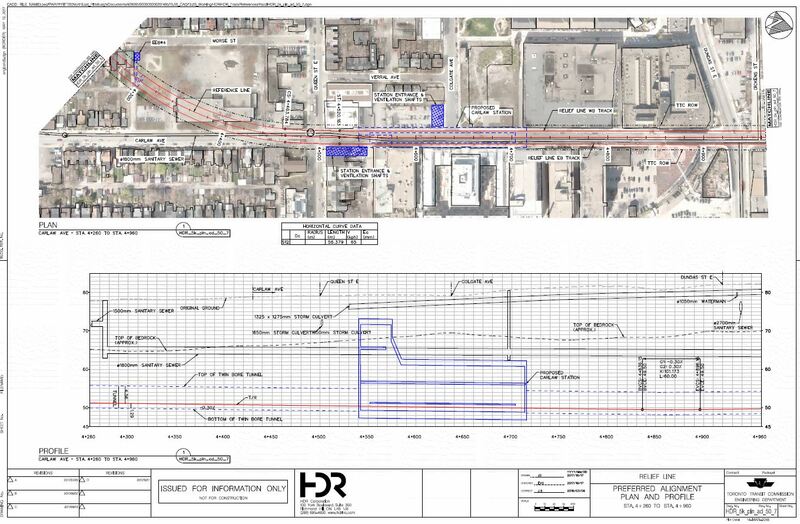 The latter two machines would be plucked out of the north tail track area at Pape Station, turned around, and then would drive south and around the curves forming the wye linking with the existing Danforth Subway. All of the stations are designed for full six-car train operation. 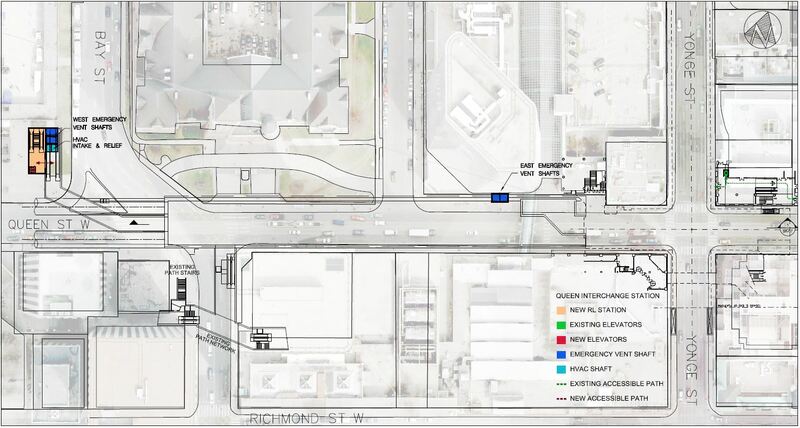 The western terminus of the RLS will connect with the existing Osgoode Station on the University Line. The station itself lies generally between University Avenue and York Street, but the structure extends west to John Street to provide for tail tracks west of the station. 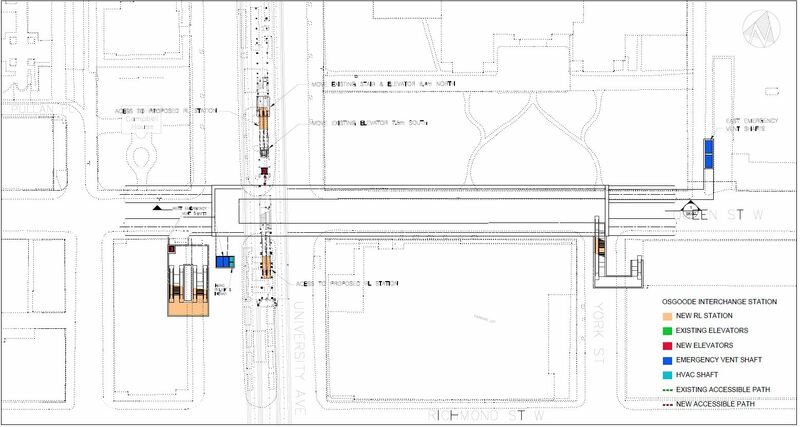 New entrances would be provided through the building on the southwest corner at University (replacing existing street entrances) and at the southeast corner at York. 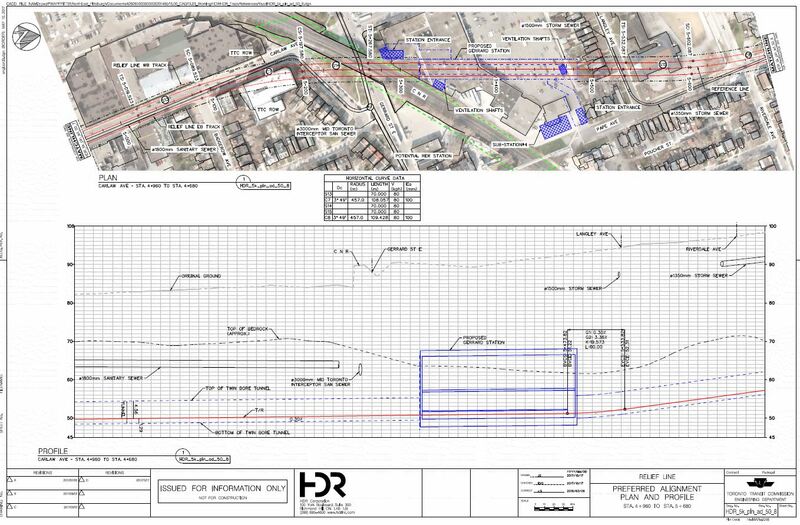 The drawings below show the street level plan followed by details of the horizontal and vertical alignments of the structure. 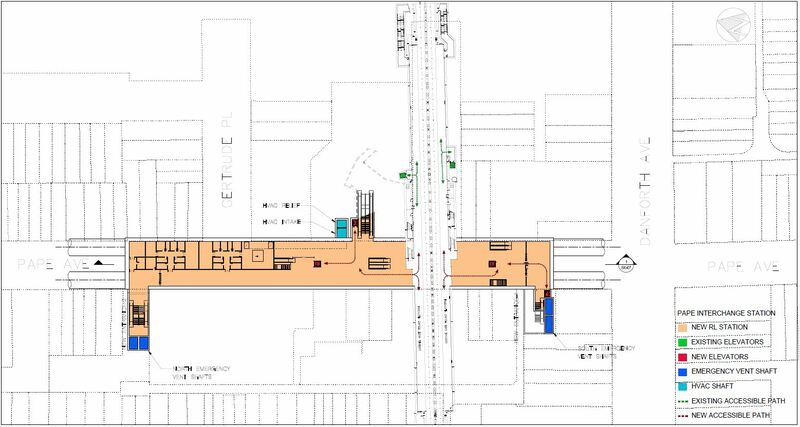 The station is quite deep because it passes under the existing subway which is the small box in the upper left of the cross section looking north through the station (below). 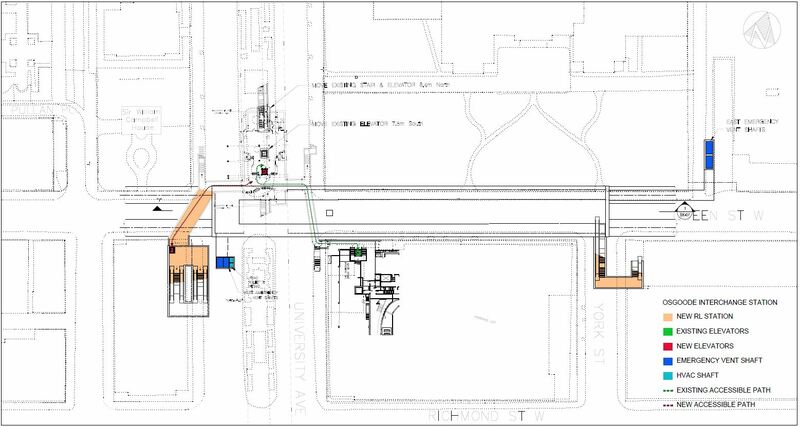 One level down from the street is the existing concourse of Osgoode Station including the main fare control area. The next level down is the existing Line 1 platform level. Below the existing subway level are two mezzanines. The upper level is not continuous, but it makes the transition from the entrances and the link to the existing station down to a second mezzanine running above platform level. Finally at the lowest level is the new station platform. This station goes by the more prosaic name of the Queen Interchange Station in the drawings, but I have used the more political of the names. The new station would lie between Bay and Yonge Streets beside Old City Hall and flanked by the Eaton’s and Simpson’s buildings at the eastern end. 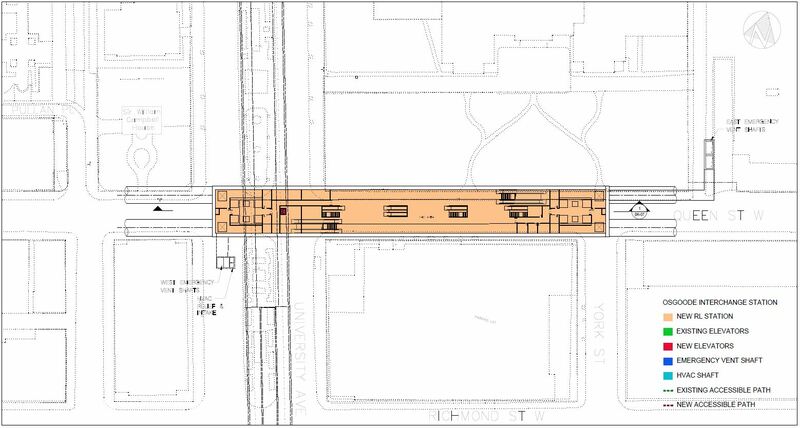 The new structure does not use the existing underpass at Queen Station which was originally provided for a streetcar subway. 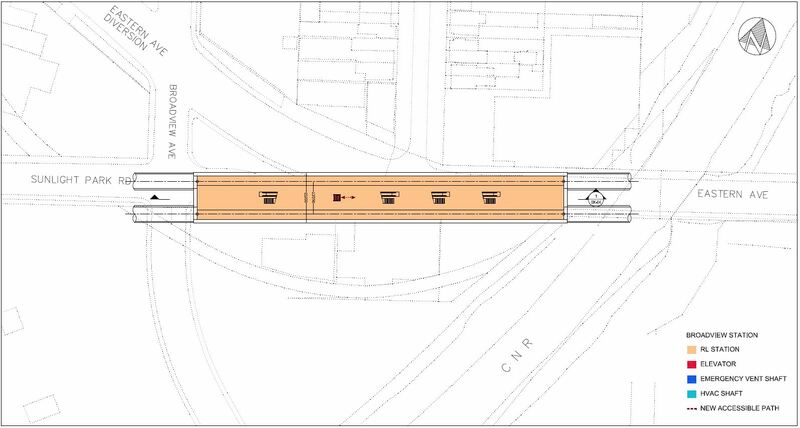 The existing subway including the underpass (original Queen streetcar subway) is on the right side (east) of the cross section below that looks north through the structure. The streetcar subway, had it been built, would have been much shallower than the RLS. 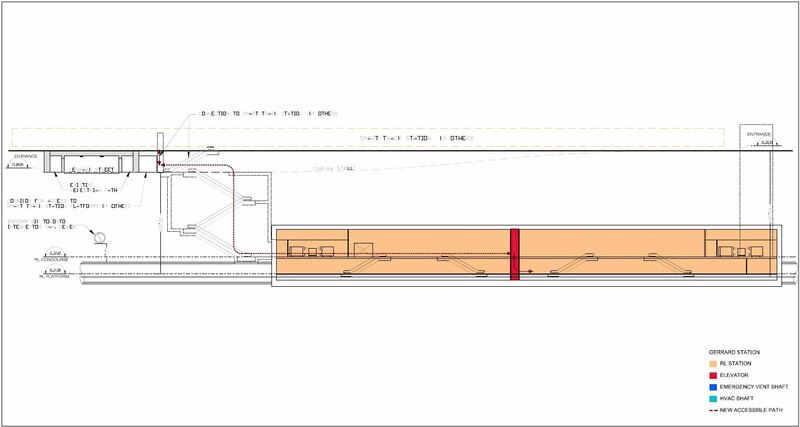 With the new station well west of the existing structure and three levels below the platform level at Queen Station, transfer connections between the Yonge line and the RLS will not be as straightforward as at Bloor-Yonge. 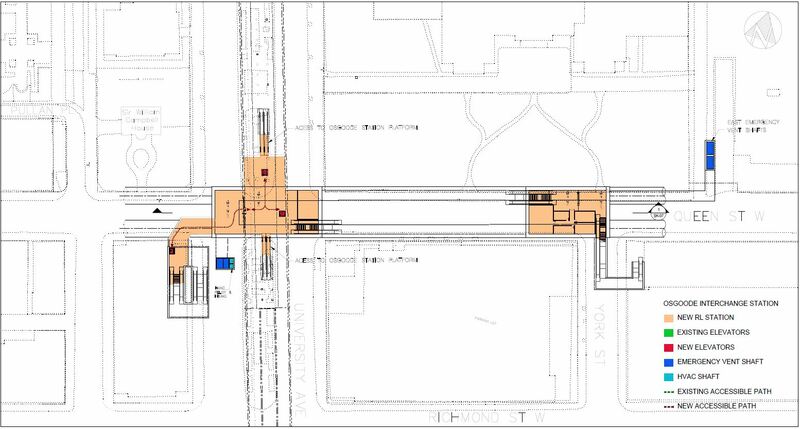 Little of the new structure is at the “one below” level corresponding roughly to the level of the pedestrian underpass crossing Queen between the department stores. 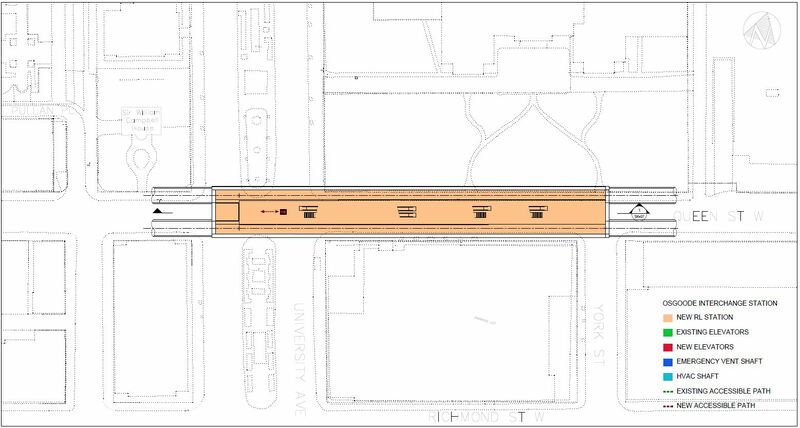 The next level down is at the level of the existing “Queen subway” underpass at Yonge Street and connects into it. 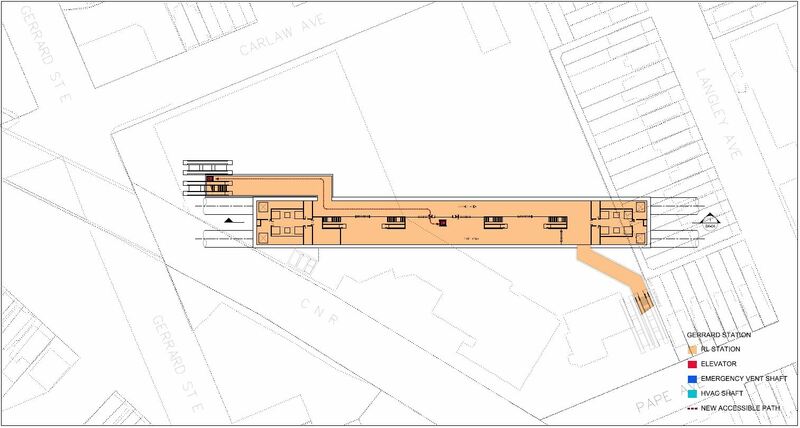 This is the transition between the paid and unpaid areas of the new station. 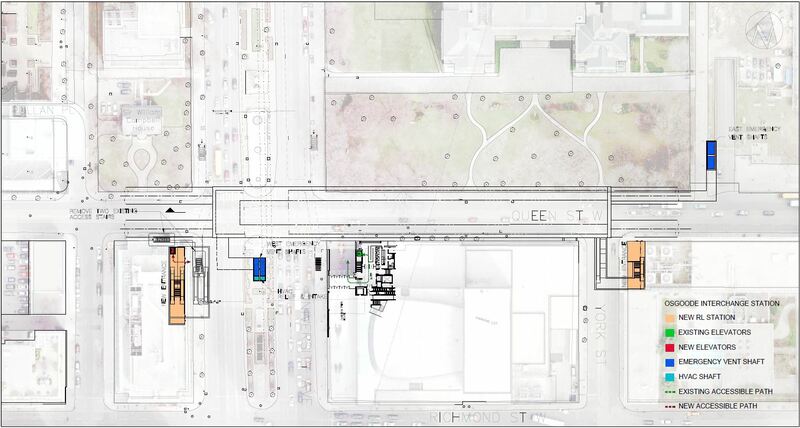 This concourse provides a link through to an exit building on the southeast corner of Nathan Phillips Square as well as a link into the existing PATH network at Bay Street. … the new station platform. Note that in some of the drawings below, this station is mislabelled “Sumach Station”. 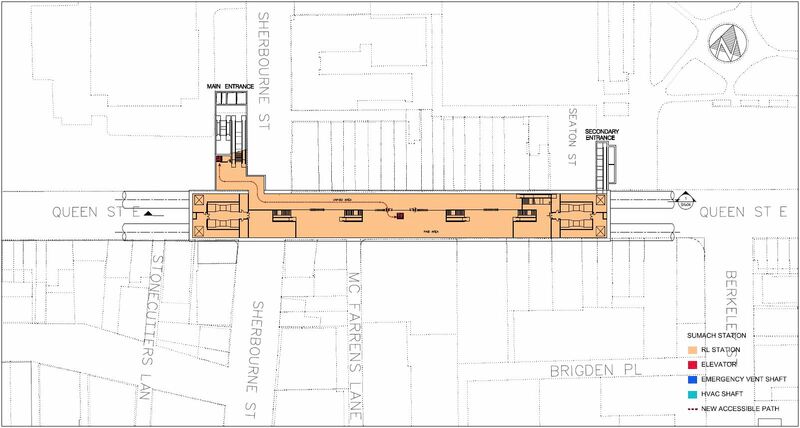 The new station at Queen & Sherbourne lies primarily between Sherbourne and Seaton Streets with the principal entrance on the northwest corner at Sherbourne. The station is structurally simpler than the interchange stations to the west. From the entrances, one descends to the fare control level, and then once more to reach the platform. 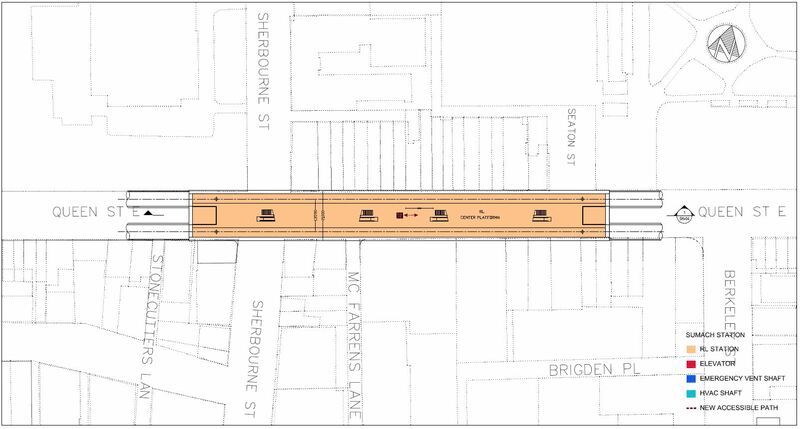 After leaving Sherbourne Station, the route veers southeast and passes under King Street just west of the Eastern Avenue flyover (aka the “Duke and Duchess Interchange” after the original names for Richmond and Adelaide Streets). The station is unusual in having exits that are not directly above the structure, but which are linked to a common fare control concourse. The station is also shallow compared to others on the RLS. 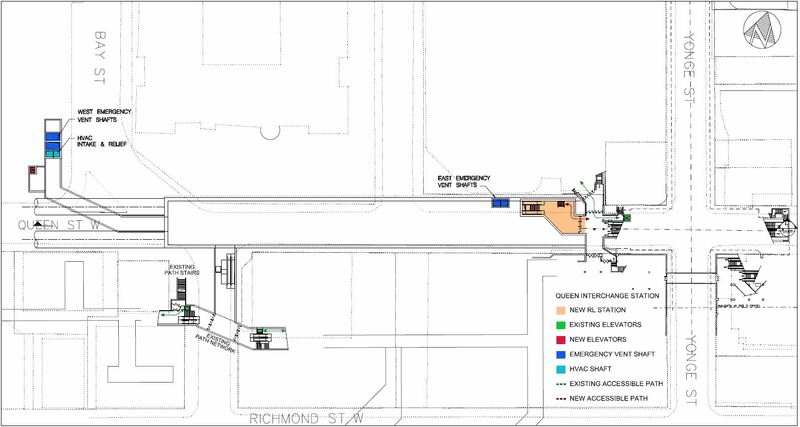 The fare control level links through tunnels to entrances fronting on Eastern Avenue and on the King/Sumach corner, as well as directly to an entrance on King at the Sackville Playground. The Don River crossing occurs well below the level of the river but still above the bedrock which deeps quite dramatically at this location. 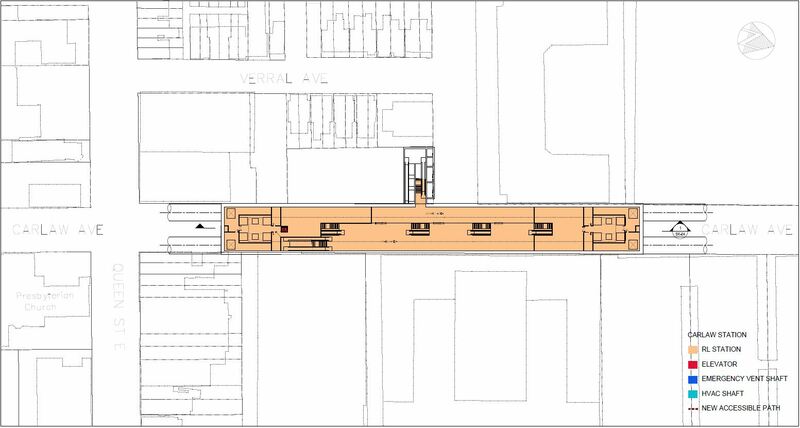 The line goes under a new building at 120 Bayview Avenue. East of the river, the tunnel follows Sunlight Park which merges into Eastern Avenue. The new East Harbour development is south of this location and will be served by the Broadview-Eastern Station (below). The East Harbour development on the Unilever lands between Eastern Avenue and Lake Shore Boulevard. A new GO/SmartTrack East Harbour Station. 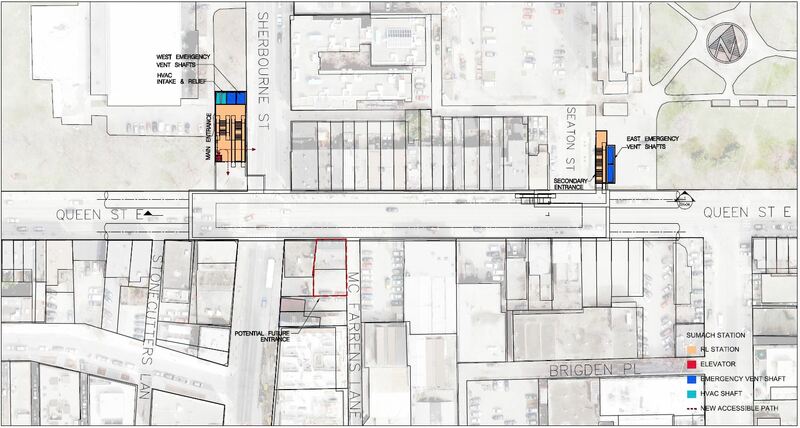 The proposed southerly extension of streetcar service from Queen & Broadview to Commissioners Street. East of the new station the line continues under Eastern Avenue, and then turns north under Carlaw. 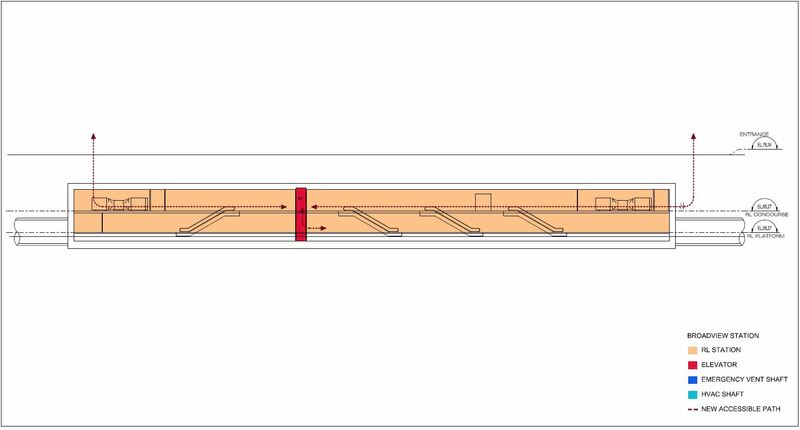 The station structure is fairly simple with two below-ground levels, one for fare control and circulation, and the platform level below. 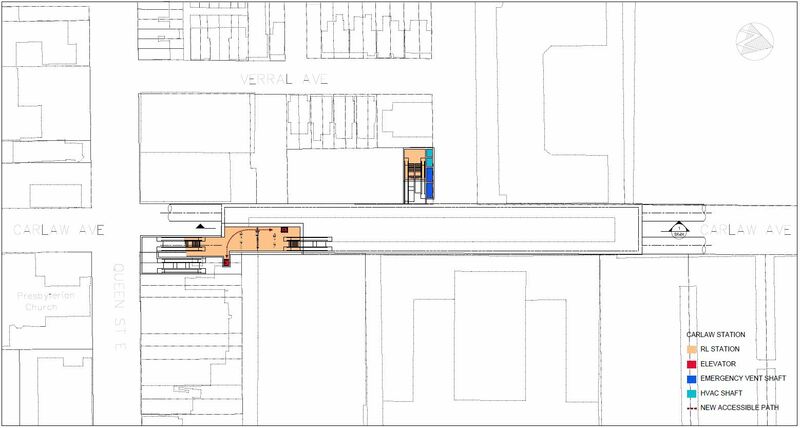 The station at Queen & Carlaw lies north of Queen Street with a primary entrance on the northeast corner. Down from the station building at Queen, the station has two levels: a fare concourse and then the platform. The secondary entrance on the west side of Carlaw connects into the concourse level. 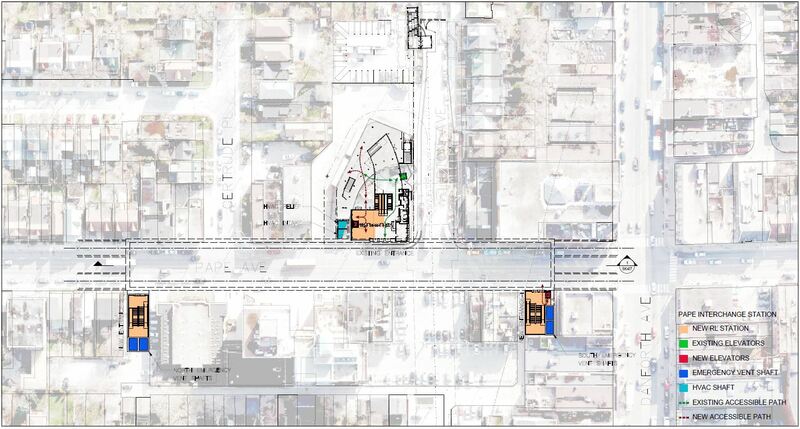 The station at Gerrard & Carlaw is fitted into the existing mall site and its parking area with the principal entrance on the northeast corner at Gerrard and a secondary entrance onto Pape Avenue south of Riverdale Avenue. No details are shown for links with the proposed Gerrard GO/SmartTrack station. The station is quite deep to stay clear of major sewer lines including the Mid-Toronto Interceptor. North of Gerrard Station, the line begins its climb to Danforth Avenue. The station entrances at street level are well above the mezzanine of the station and the platform below. 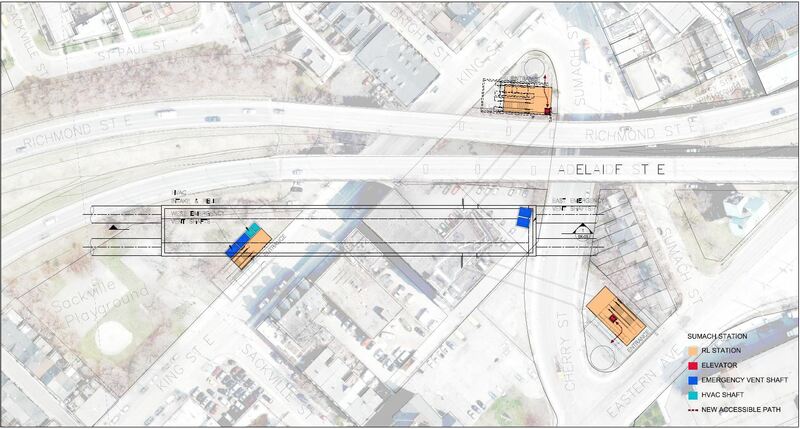 This will not be a quick transfer connection with surface transit, and projections for this to be a major interception point for streetcar travellers headed downtown could be optimistic. At the mezzanine level, the two station entrances link into the fare control concourse, and thence to platform level below. North from Gerrard Station, the subway climbs on a continual grade toward Danforth, and breaks out above the bedrock which is quite deep here. 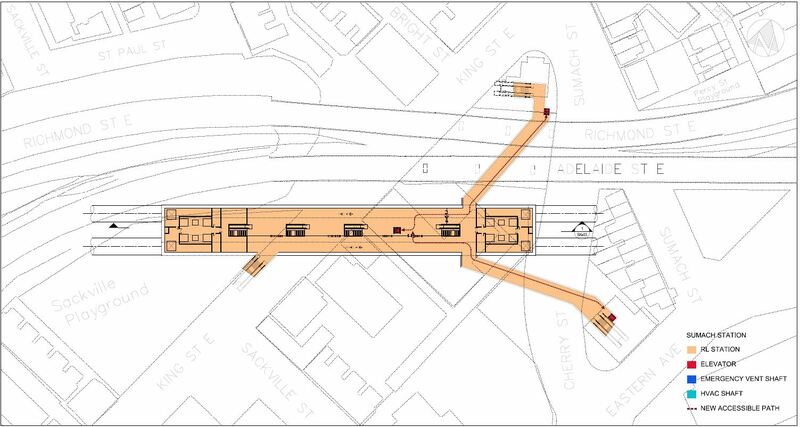 The interchange station at Pape and Danforth linking to Line 2 Bloor-Danforth is quite complex. 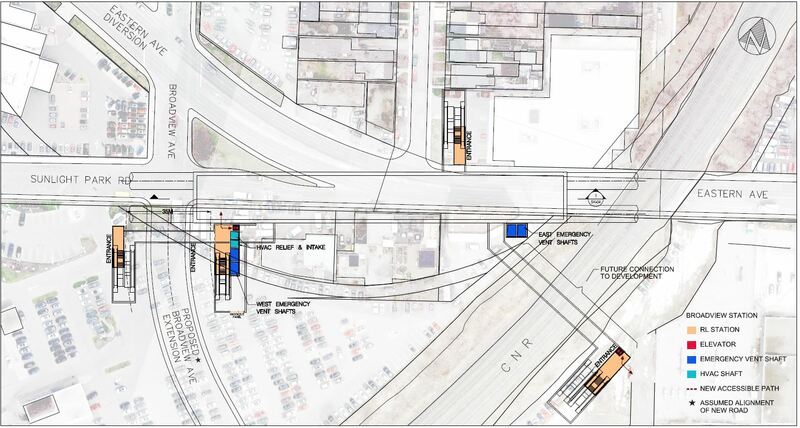 As with the interchanges downtown, the path between the two routes is not as simple as at existing junctions. 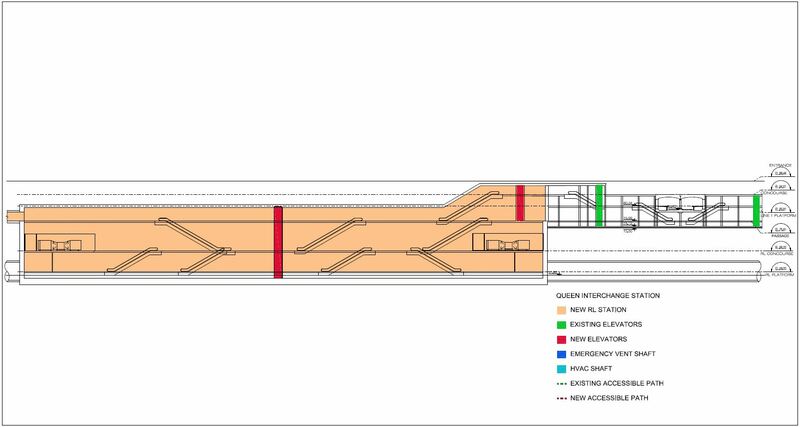 However, the new station’s design appears to focus more on the link to the existing subway (which is the raison d’etre of the RLS itself) than to the surface bus interchange whose importance would decline, eventually, when the Relief Line North replaces demand from surface bus routes. 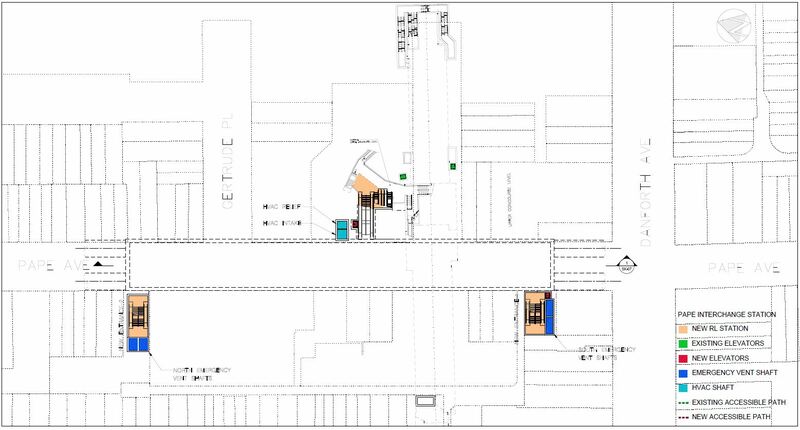 New entrances will be provided on the west side of Pape both at the south end of the station near Danforth Avenue, and at the north end. 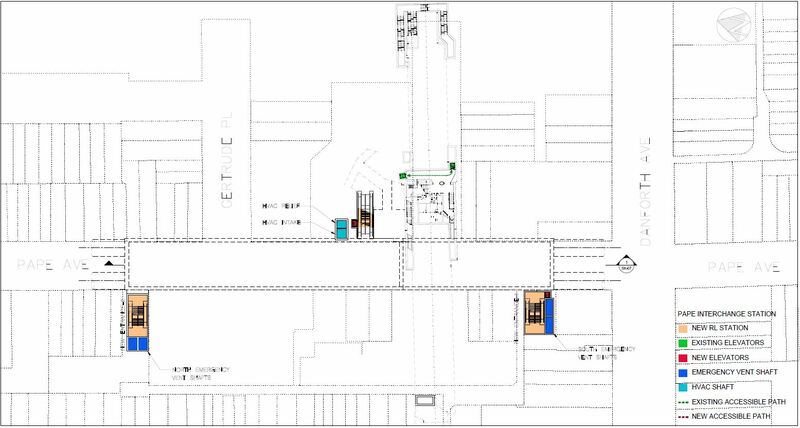 The existing station will also see changes related to accessibility and a link into the new concourse structure. 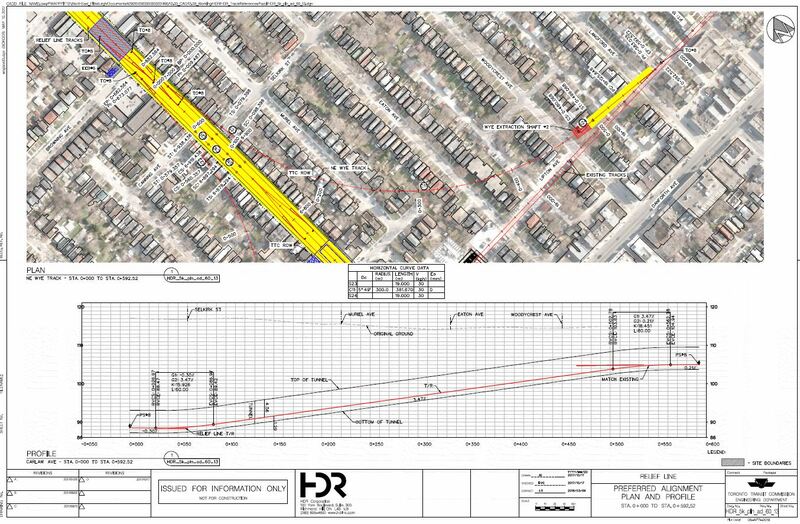 In the drawings below, note that north is at the left on the street level plan, but is at the right on the alignment plan immediately following. 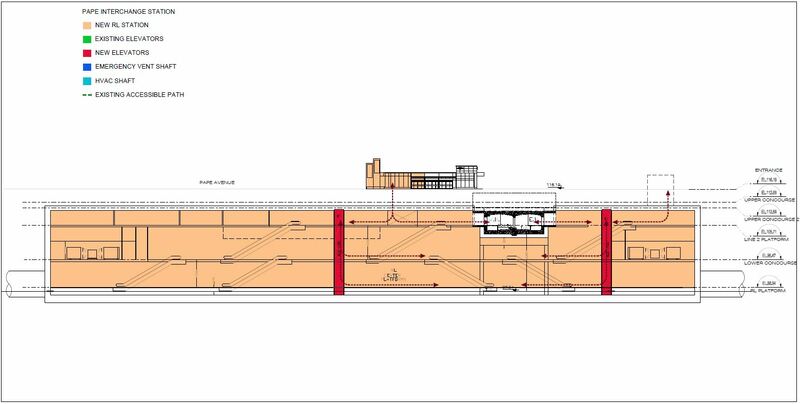 The comparative depths of the new subway and the existing Pape Station are quite clear in the cross-section below. 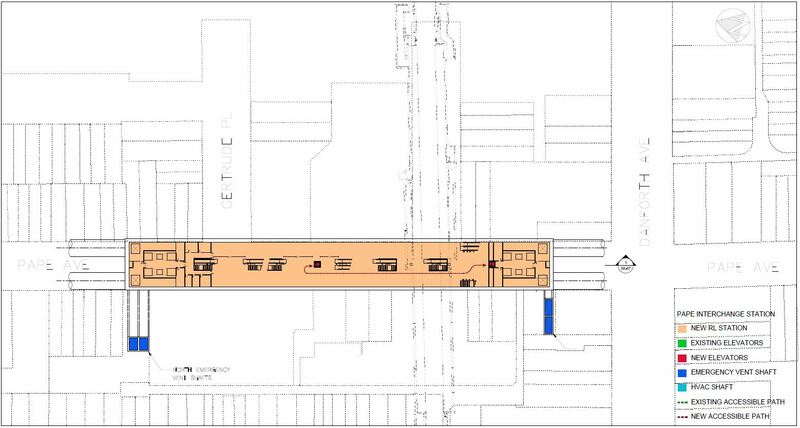 The first two levels down from the street include existing passageways from Pape Station entrance and bus loop down to the Danforth Subway. 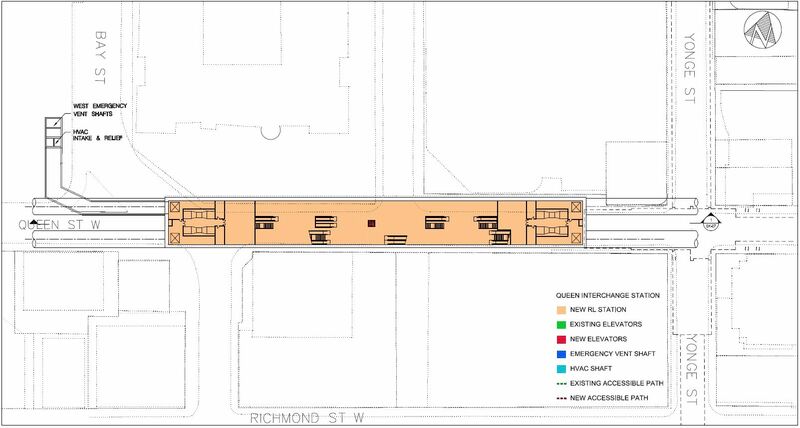 At the level of the existing Danforth Subway, a new concourse will provide access to the platforms, and links up to new and future entrances as well as down to the RLS station’s mezzanine and platform. North of Pape Station the tunnel will continue far enough to accommodate a junction with the Danforth Subway and three storage tracks, two of which would become running tracks once the line is extended. 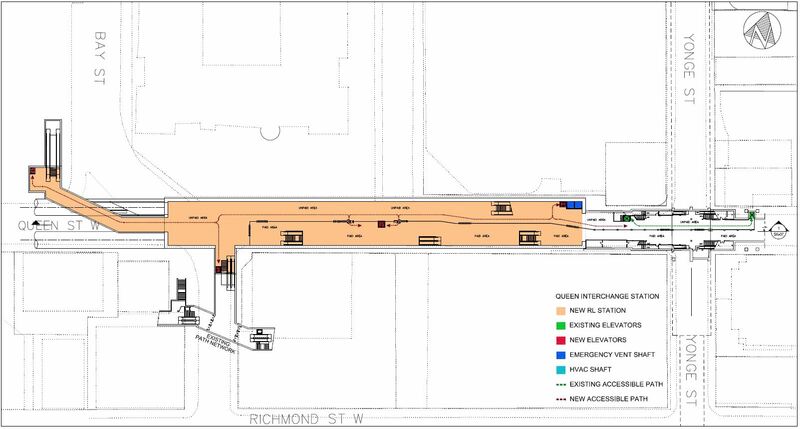 The link between the RLS and the Danforth subway is not intended for frequent traffic, but rather for occasional carhouse moves to and from Greenwood. There will be single track tunnels forming south-to-west and west-to-north curves. Because of the depth of the RLS structure, these links will have about a 3.5% grade. The actual construction will be performed mostly using the Tunnel Boring Machines under existing buildings. 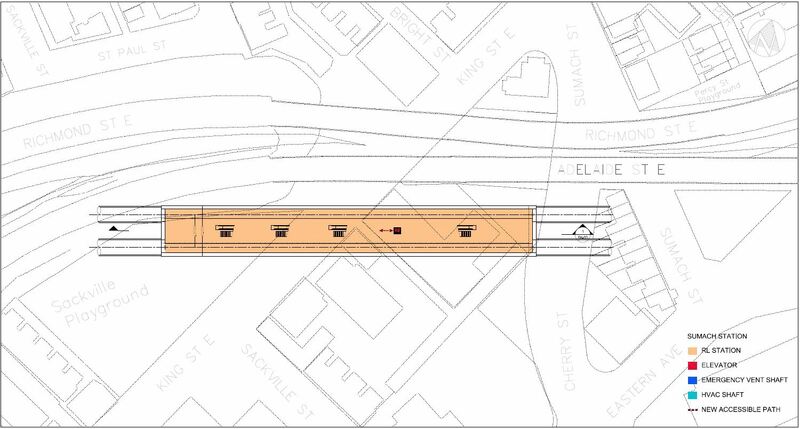 For a short distance where the structure links into the existing Danforth Subway, the work will be done as cut-and-cover with these sites doubling as TBM extraction points. In the drawings below, the areas in yellow show the extent of excavation as opposed to tunnelling. This entry was posted in Downtown Relief Line. Bookmark the permalink. 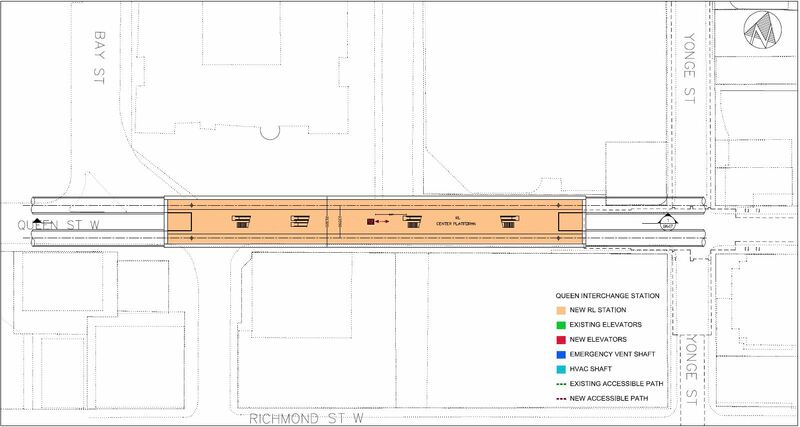 Does the Mid-Toronto Interceptor force the RLS to be tunnelled at the planned deep depth no matter which northbound route from Queen Street, other than Carlaw Avenue, is used to reach Pape Station? 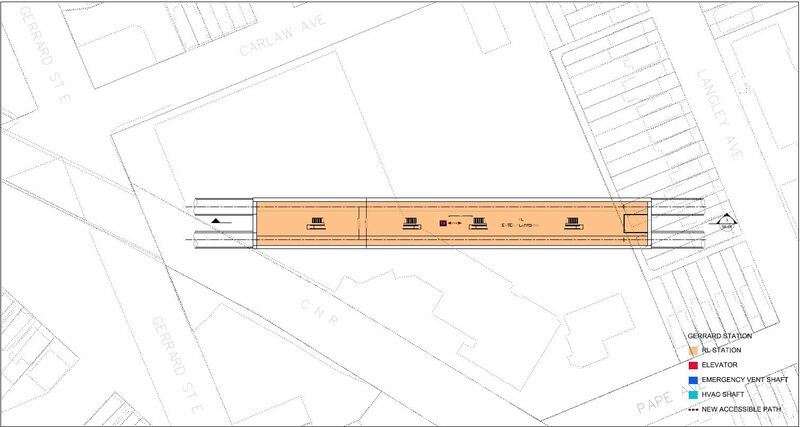 If the RLS was planned to terminate at Donlands Station, for example, could it be built directly below the Line 2 station? Steve: The Mid-Toronto Interceptor runs to beyond Greenwood, and so all north-south routes are affected by it unless they are built much closer to the surface, a choice that would bring its own problems. Wow, that’s quite deep, didn’t realize Gerrard stn was planned north of the railway corridor. You’re bang on it wouldn’t work. 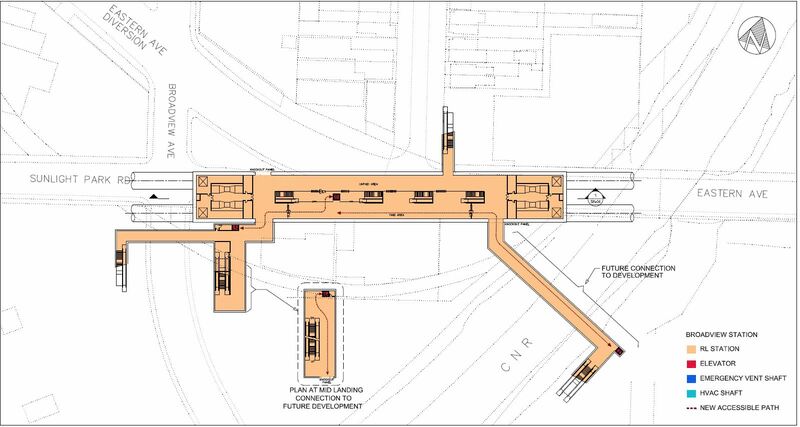 If they planned the Gerrard stn parallel with the railway corridor underground, it might fly. This might be the better post to file this observation from someone who’s done far more cycling out of TO than I have. Steve: I note that the words “streetcar track” do not appear in this article, and that the author’s primary concerns are the sense of motorist entitlement and the driving speeds on streets.